cheese | Anyone can cook even Tina! Anyone can cook even Tina! But we are talking antipasti (the plural of antipasto) here. Antipasti is what YOU make it. Let your imagination run wild. I suggest you get a few staples to keep in your cabinet, so on the nights you just do NOT feel like cooking, nor going out, a quick stop at the local HEB will get you the fresh ingredients you need for your quiet night in eating something other than what-passes-for-pizza in Texas (sad but true). Roasted red peppers – These can be canned or in a jar. They must be ROASTED. Artichoke hearts – Either packed in olive oil, or water, doesn’t matter. You can add the oil later. Marinated Vegetables – Not necessary, but nice to have if you are too tired/lazy to make a salad. Olives – any kind you like. I like green. Now…what you need from the store – Here is where poetic license comes in. Try and choose things that have different flavors, textures…that is what keeps it interesting. 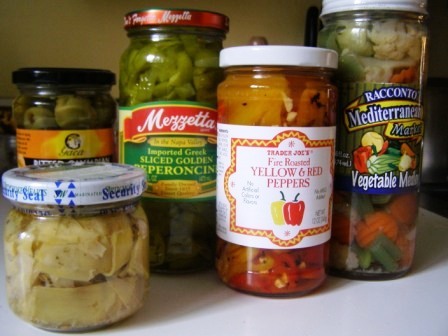 Take the staples from your cabinet for example – the roasted peppers are sweet, smooth; the peperoncini spicy, al dente; the olives, salty; the marinated vegetables – crunchy and acidic. Like any relationship, you need to ‘mix things up’ so it doesn’t get boring. However, you don’t want to overwhelm. 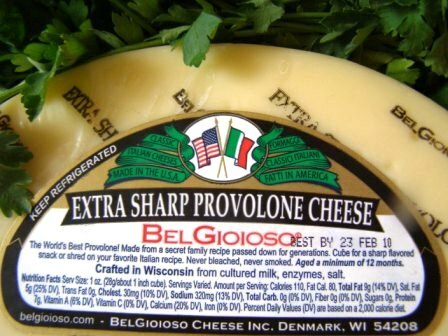 So my suggestion is…two cheeses – a good stinky Italian cheese like sharp Provolone, and a creamy mellow cheese like a fresh mozzarella. Next, head over to the deli department. 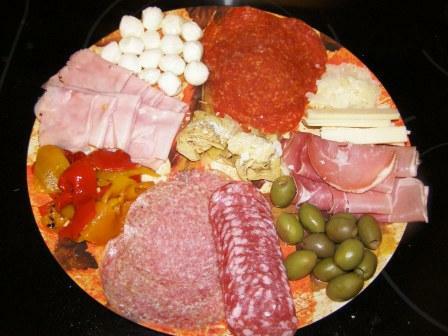 Use the same concept of variety with the cold cuts. Sweet, spicy, smoky, chewy…yes, you can have it all. First, get some Genoa Salami. Then, some Pepperoni. Then, Prosciutto This is pronounced “Pro-JOO-toh” if you try saying it any other way in Texas (like proJOOT) they will look at you like you have two heads and say “WHUT?”) If the have Cappacuolo, (Italian ham- either sweet or hot) You can pick up some of that as well – about 1/4 pound of each. If they do not have Cappacuolo, simply get a regular ham. Oh! 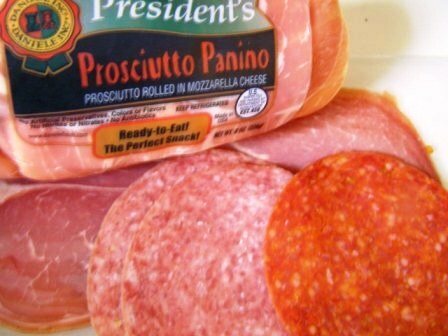 and if they have Prosciutto Panino (see picture) pick that up too – Prosciutto and mozzarella roll – yum OH! Now, head over to the bakery and pick up some Ciabatta bread. You’re done! For a treat, stop at the liquor store and pick up a bottle of Prosecco. Martini & Rossi is excellent, about $14/bottle. Get that for your first bottle, then you have a good bottle to compare others to. Prosecco is a sparkling wine made in Italy. It’s the Italian version of champagne, but it’s not as bubbly as champagne. There are actually three different types of prosecco – tranquillo, or a still wine; frizzante, or with subtle bubbles (I love this kind) and spumante, which is like a champagne. The frizzante will come with simply a cork and some twine on the top that you remove with a corkscrew. Martini & Rossi Prosecco is frizzante. People in Italy drink Prosecco when they get together – they’ll have it before a meal while chatting at a ristorante or a bistro. It’s something that brings people together. I love that idea! Now you are ready to eat! Get a couple of plates. Arrange the cold cuts in a pretty pattern – heap some olives in the center of the plate, put some cheese in between the stacks of cold cuts. You’ll probably need two dinner plates to arrange your stuff on. Arrange the red peppers, artichoke hearts, veggies on another plate. Uncork the wine, cut the bread – put a bit of olive oil on a saucer, and grind a healthy amount of Italian Seasoning onto the plate, and a dash of Seasonello. Put on some Andrea Bocelli, light some candles, hunker down on the couch with hubby, and Mangia!